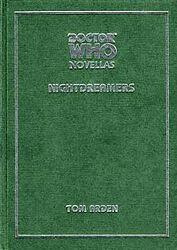 In November 2001, British company Telos Publishing launched the first BBC-licensed Doctor Who "novella". Novellas are between 20,000 and 40,000 words in length — in other words, longer than a short story but shorter than a novel. This range of novellas was intended to push back the boundaries of Doctor Who fiction, and feature books written by a range of established authors. Each novella was available in two different editions: a standard hardback (UK retail price £10), and a limited-edition "deluxe" hardback (UK retail price £25), featuring unique frontispiece artwork and signed by the author & artist. Unfortunately, after a couple of successful years, the BBC declined to renew Telos's licence to publish Doctor Who fiction, and hence the range of novellas came to an end in early 2004 after 15 books were published.